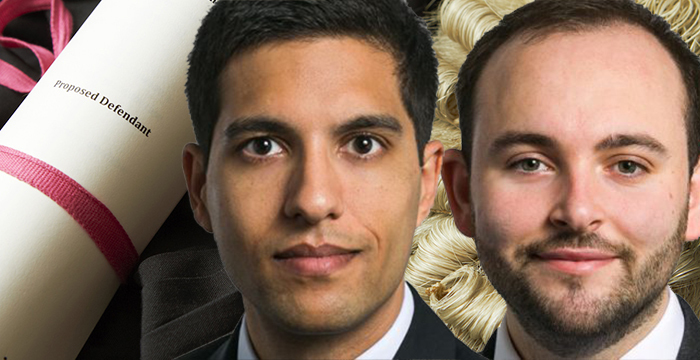 As the clock ticks down towards the Pupillage Gateway deadline tomorrow, we have gathered two Hardwicke pupil barristers to help you with your last-minute applications. Usman Roohani and James Shaw are on hand to answer your questions in the comments section below this article from 6pm. Both completed the Bar Professional Training Course (BPTC) in 2016, having done law degrees, before successfully securing pupillage. In between they worked as paralegals at Linklaters and Mishcon de Reya respectively. What swung it for them in their application forms? Do they have any tips for adding sparkle to submissions through the Gateway? What do they advise against writing on application forms? Ask them these questions — and anything else you’re curious about in relation to pupillage and the bar — in the comments section of this article from 6pm, where they will be taking questions until 7pm. I don’t recall the exact numbers but would estimate that, over two years, I made approximately 20 applications in total (inclusive of Gateway and non-Gateway sets). I was probably invited to around 7-8 interviews across the two years, not including second rounds. Why the bar and why Hardwicke? Is it advisable to be willing to diversify on applications or would this appear to chambers as non-commitment to a particular practice area? You will want to strike a balance. If you have a particular area of specialist interest, then definitely focus on making those targeted applications as strong as you can. But beyond that, I think everyone acknowledges that pupillages are in short supply and that almost all applicants will apply around their areas of interest too. Do you think there is a formula for writing pupillage applications? If so, what is it and where can it be found? No – and trying to find one is likely to damage the quality of each application you write in accordance with that formula. Some of the Gateway questions lend themselves to more formulaic answers (e.g. why do you want to come to the Bar?) but do try to develop original and interesting reasons, rather than repeating what the reviewer of the form has (probably) read hundreds of times from other applicants over the years. How do you demonstrate interest in a set of chambers and its practice areas on an application? There are many ways to do this! The most obvious way is to comment on your experiences at mini-pupillages (either at the set you are applying to, or to sets with similar practice areas, or both), or other relevant work experience. I suggest picking one or two concrete examples of what you enjoyed so that you can make a meaningful point about why exactly you are interested in a particular area of practice, rather than making a handful of generic comments as many applicants do. How much research did you do for each pupillage application? i.e. what was the extent of your research, and how did you go about doing it? The obvious place to start is Chambers’ website. I would also suggest using social media and directory rankings (etc.) to see trends in how Chambers is marketing itself. Little is to be gained from regurgitating material found on the website. You then have to take a view as to what parts of your research you wish to incorporate into the application form (and how). Showing Chambers you did your research is not an end in itself; your research should relate to the rest of your form to create a full picture of why you are a good fit for Chambers and vice versa. How accurate is the phrase ‘pale, male and stale’ to describe the bar? What are chambers looking for when they ask – why would you be a good barrister (other than advocacy)? Thank you. Firstly, I would caution against trying to answer any question with the thought in mind – ‘what is this question trying to elicit’. The reality is that almost all of these open-ended questions can be answered in an infinite number of ways, and interview panels probably want to see an element of your personality coming out in your application too. I suppose that the traits that many Chambers will want to see are (i) a commitment to a career as a barrister, (ii) resilience to be able to handle an intense and occasionally solitary profession and (iii) an ability to think on your feet. This is far from an exhaustive list though. I think this is a hard (but interesting) question because no one can predict the future. I’m afraid that I can’t answer for crime as I have no experience in that area at all. As for the civil Bar, many people who previously predicted radical changes to the Bar have been proven wrong (so far, anyway). For my part, I am fairly conservative about what will happen to the self-employed Bar. If a radical change is due, it will come from the demand side, i.e. solicitors, who we work for. I think that the solicitors’ profession is currently satisfied with the structure of the independent Bar as it allows solicitors to instruct barristers on a brief-by-brief basis, with no obligation to send repeat work to any particular barrister, and no need to stick to barristers in any one Chambers. I would say that the current trend in terms of barristers becoming more specialised earlier on in their careers is likely to continue. The provision of services on a direct access basis may also be worth thinking about and looking into, but again I have no real insights there. Should I mention my (quite severe) nut allergy in the ‘Do you have any special requirements if you are invited to attend a pupillage interview?’ section? Or does this make me look fussy/like I’m expecting to be served a meal? Yes, certainly. I can’t imagine that pointing out an allergy will ever be held against you! Reflecting upon your past pupillage interviews, what do you think worked well for you and what did not? My personal experience of interviews in my first cycle of applications was that I was too inconsistent in performance and failed to properly manage my nerves. Interviews therefore tended to go either very well or very badly (from my perspective). In my second year, I tried to increase the level of preparation I did for interviews to counter the nerves. I spent a long time planning out (in general terms) answers to competency-based questions – which tend to be difficult to answer persuasively on the spot – and mind-mapping all the skills/experiences I had against the pupillage recruitment criteria of each set at which I was being interviewed. d. Have in mind the basics of contract/tort/ethics (etc. ), which could arise in the context of problem questions. Is it advisable to apply to the max number of Chambers that the gateway allows? I don’t see why not, subject to the usual caveat that generic applications are unlikely to get you through the paper sift. I generally take the view that, as you have quite a substantial period in which to make Gateway applications, you should not find yourself pressured into making unduly generic (or sloppily drafted…) applications. Ultimately, however, it is going to depend on whether you are targeting specialist or generalist sets and how much time you are able/willing to put into the Gateway process. I don’t think there is one approach which fits all. I self-funded the BPTC and didn’t get an Inns scholarship, do I have a chance? (I have a fairly high 2:1 from a Russell Group uni and decent A-levels, but I went to a private school and am not at all diverse). Also, to the best of my knowledge I have never won a scholarship/award/prize. If I am not a lost cause, what do I emphasise in my application? Thank you for this comment – I also self-funded and wasn’t given a scholarship. There are plenty of examples of extraordinarily successful barristers who have non-traditional backgrounds and routes to the Bar. It would be a shame to write yourself off because you don’t think that you tick a number of boxes that, admittedly, many pupils do. Emphasise your strengths, abilities, experiences and commitment to the profession in whatever ways you can. That will be more interesting than any list of prizes. You should take a realistic approach to your applications, but I see no reason why you can’t emphasise other things which outweigh the weaker parts of your application. For instance, I took the view that my academics were not the strongest part of my application and therefore focused on things like mooting, pro bono, and practical advocacy experience. In other words, play to your strengths and recognise but minimise your weaknesses. By way of general comment, not falling into a category of people who are disadvantaged in their chances of accessing the Bar is not itself a form of disadvantage and such thinking only holds people back. I think it is essential to evidence your interest in and commitment to (i) a career as a barrister and (ii) the area(s) of practice of the Chambers to which you are applying, and by far the easiest way to do that is to do a few mini-pupillages in the area. Some people also mention doing mini-pupillages in other areas, as a way to explain why they DON’T want to practice in a certain area. But I wouldn’t advise doing this unless it genuinely reflects your particular thought process over the months/years. Should we reflect upon and demonstrate our own X-factor (i.e. what sets ourselves apart from the rest) when writing an application? This is an advice I have come across, but I wonder if we need to worry much about it. It seems a tall order in itself to tick all of the boxes and have solid answers to ‘why this chambers and this practice area(s)’. Don’t overthink it. It is easily said, but try and let your personality come out naturally in your answers. Do cover the main bases (the ‘boxes’ you mention), and put some thought into presenting yourself in your best light, but worrying about whether you are demonstrating an ‘X-factor’ seems to me to be a step too far! I can code. Law firms seem to like this but will chambers? Should I mention on the app form? Thank you Usman and James for all your responses! Heartfelt thanks.